year of 2018-19. There are total 137 Army Public Schools (APS) in various cantonments in India. Selection for these vacancies will be held through a written test only. Selected candidates have to work for 3 years of extendable contract. For PGT teachers candidates have to undergo for 1 year probation -which is extendable up to 3 years. Eligible candidates have to apply online from 01-10-2018 to 24-10-2018. For more details regarding AWES APS Teachers Jobs of PGT/TGT/PRT see the details given below. 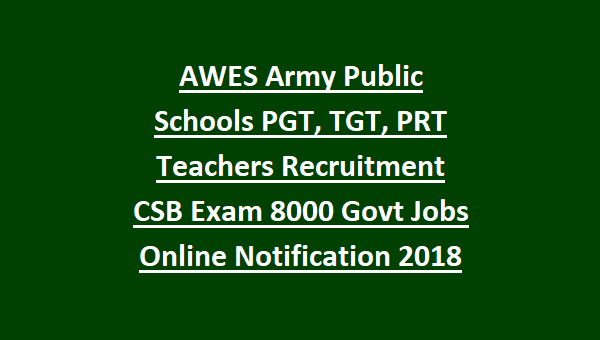 There are total 8000 vacancies available in this current recruitment of Army Public Schools. School wise or cantonment wise vacancy details are provided separately. Age limits are below 40 years. NCR Schools TGT/PRT teachers upper age limit is 29 years and for PGT Teachers upper age limit is 36 years. For Experienced candidates upper age limit is 57 years. Those who are qualified CTET/TET which is conducted by state governments those candidates will be appointed as Permanent or temporary basis. For others it will be on Adhoc basis only. However CTET/TET is not mandatory to attend the CSB Screening Exam. Click here to see the complete details regarding education qualification for TGT/PGT/PRT Teachers Jobs. Salary will be decided by respective school management as per Central government Basic Pay and Grade Pay. For Post Graduate Teachers probationary period will be one year initially it will be extended up to 3 years if required. Examination fee is Rs.600/-. Candidates have to pay this amount at the time of online application using debit or credit card or internet banking. Selection for this APS CSB PGT/TGT/PRT teachers recruitment will be held in 3 stages. 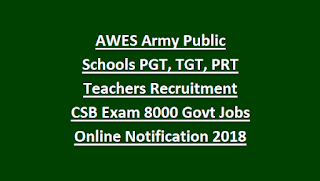 Eligible candidates have to apply online using the official website of Army Public Schools @aps-csb.in/college on or before 24-10-2018.